We’re big fans of the food of New Orleans. Whether it’s the upscale Creole cuisine served at the fine restaurants around the Crescent City, or the down-home Cajun food found at hole-in-the-wall kitchens all over Louisiana, we love the cuisine of our neighbor to the East. The only problem is that it can be tough to find… especially as you get farther outside the Loop. So you can imagine our interest when we received a tip from a reader about a new restaurant opening on Market Street. Called Schilleci’s New Orleans Kitchen, it’s a family-run restaurant located on Market Street in the shadow of the Avia Hotel. Wait a minute. Family run? On Market Street? The place where the new Tiffany’s just opened, and Tommy Bahama’s is inexplicably busy all the time? It’s true. The Schilleci family has opened this intimate, elegant French Quarter-style restaurant on Market Street. 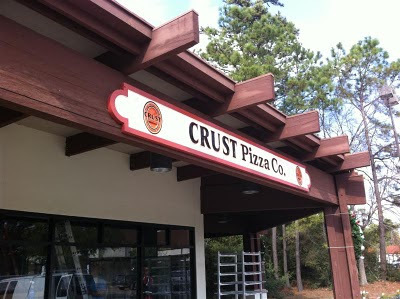 The family had operated a small carry-out cajun cafe in Spring, but when their lease ran out, they decided to head north to the Woodlands to open a full-service restaurant. Market Street is truly becoming the culinary capital of Montgomery County. 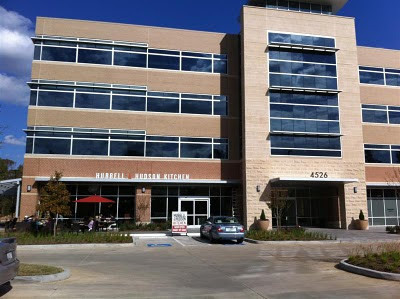 The restaurant is strategically located by both the Avia Hotel and the parking garage. So unlike just about every other restaurant on Market Street, parking should be plentiful and nearby. We visited Schilleci’s for a late lunch on their first day in business, and met most of the family. 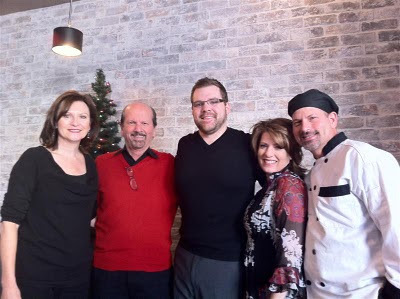 Wayne Schilleci, Sr is the patriarch of the family; he and his wife Debbie were overseeing the bright, airy dining room from a strategic location in the corner. Wayne Sr was also talking with every customer, soliciting feedback and displaying the type of humility that’s rare in the restaurant business. Their son Zach was overseeing the front of the house, welcoming each guest and coordinating the operation of the very new waitstaff. Wayne Jr is the chef, and was putting his kitchen staff through their paces – in this brand-new restaurant, many of the cooks had never worked together before, and had to learn to coordinate their efforts. But how is the food? We know it’s not fair to pass judgement on a restaurant’s cuisine on its first day, but we want to pass along our initial impressions. We sampled a couple of New Orleans classics: Jambalaya and Seafood Gumbo. First, the Jambalaya. 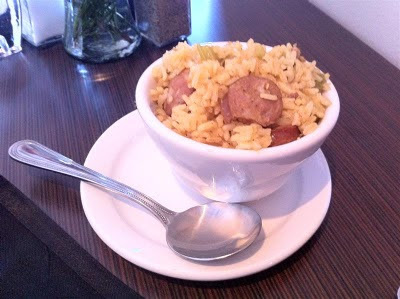 Our cup was overflowing with chunks of soulful, coarse-grained Andouille sausage and thick slices of spicy Italian sausage. Completing the dish was some beautiful saffron-colored rice, seasoned with peppers, onions, and a hint of celery. The heat level was moderate, starting deceptively slowly and building up to a nice controlled burn. The heat was masterfully balanced with the savory flavors in the dish, something that’s all to rare in Cajun cooking. Next up was the gumbo. We sampled Schilleci’s seafood gumbo, a sharp, spicy roux packed with plenty of nicely-sized gulf shrimp and lump crabmeat. The roux had a simmering, balanced heat, and the onion, pepper, and okra flavors melded to create an exceptional background for the fresh seafood. 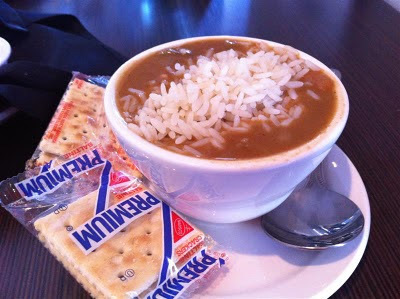 We love gumbo, and Schilleci’s may be the best gumbo we’ve had in Texas. We were particularly impressed that we didn’t have to kick up the roux with a few drops of Tabasco – Chef Wayne is not afraid to season his gumbo, and deftly walked the line between too bland and too hot. Schilleci’s didn’t feel like a restaurant that had just opened. The staff was knowledgeable and friendly, the food was very well prepared, and the cozy interior was beautifully finished – the dove grey walls were adorned with photos of New Orleans taken by another family member. Considered touches were all around; even the ceiling was tiled with ornate squares that evoked the feeling of a hundred-year-old establishment in the Quarter. 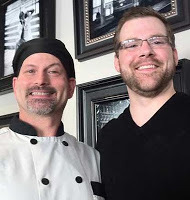 And the Schilleci brothers seem to naturally fall into the two key roles needed for a successful restaurant – a talented chef in the back of the house, and a gracious host who’s working the room and keeping the patrons happy. 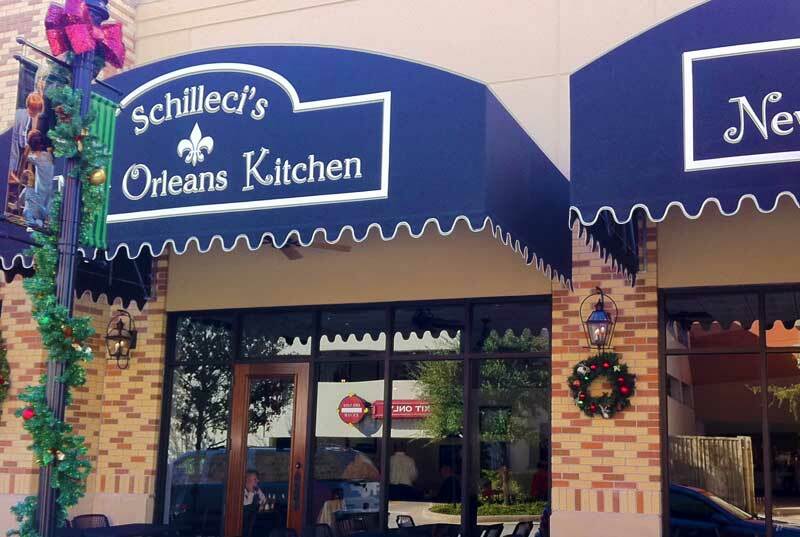 We predict that Schilleci’s will be a big success; it’s a totally different dining option for Woodlands residents, and the restaurant is overflowing with the type of warmth that only comes from a family-run establishment. we tried to eat there once and were turned away because 6 of the empty tables were reserved for people that weren't there. WTF? Seat people that ARE there then give then first available table to the folks with reservations (if they ever show up)…..DUH!!! !